This image of an impromptu champagne pop took place in the late afternoon one sunny October day in front of an old train at Liberty State Park. The champagne backlit against the dark train creates contrast and highlights that add unique and random texture to the image. The bride’s expression, while barely visible through the champagne, is one of clear excitement and elation. She is wearing a beautiful, cropped A-line wedding gown with a sparkly belt. Among the wedding party members, some can be seen ducking and running away from the spraying liquid, while one other is trying to pop a second bottle. 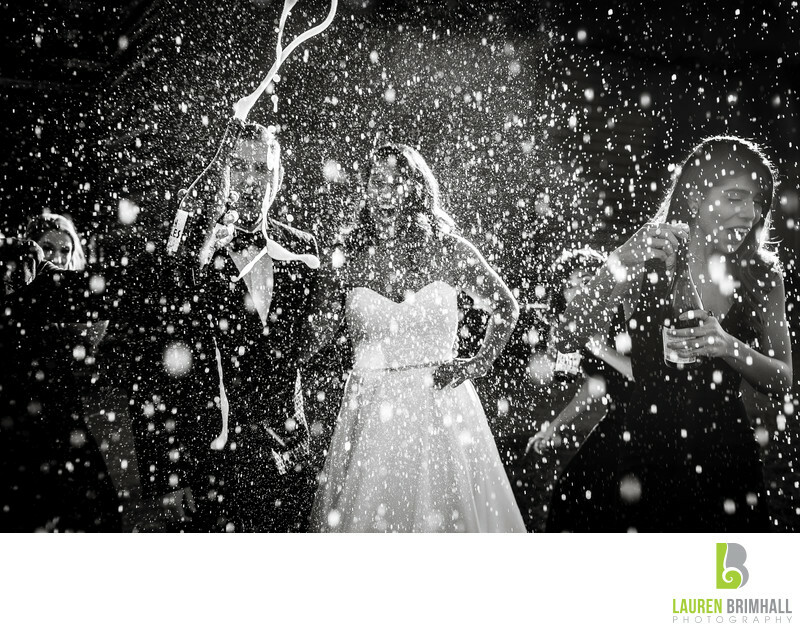 The choice of black and white for this image simplifies the moment and centers the focus onto the bride and groom. The moment depicted is authentic, spontaneous, and fun, which is how many couples prefer to remember their wedding day. The element of chaos also adds to the image, and is reminiscent of a typical wedding. The couple’s actual ceremony had just taken place at St. Henry’s Church in Bayonne, NJ. Their reception was later held at the Avenue A Club in Newark, NJ. This image received an Honorable Mention From Fearless Photographers in 2017. Fearless is a reputable and International wedding photography organization comprising hundred if not thousands of photographers worldwide.